A United Launch Alliance Delta II rocket launches NASA's Soil Moisture Active Passive observatory into space from California's Vandenberg Air Force Base on Saturday, Jan. 31, 2015. The space agency's new Soil Moisture Active Passive satellite (SMAP) satellite successfully launched to space atop an unmanned United Launch Alliance Delta II rocket from Vandenberg Air Force base in California at 9:22 a.m. EST (1422 GMT). SMAP is designed to map the moisture levels in topsoil around the world to help scientist better predict droughts, floods and other weather factors. The spacecraft soared into space and deployed its solar arrays after a flawless launch, NASA officials said. The SMAP satellite measures moisture in the top 2 inches (5 centimeters) of soil on Earth by using two instruments designed to gather more accurate data about Earth's soil than ever before, officials have said. The mission was initially scheduled to launch on Thursday (Jan. 29), but was delayed 24 hours due to unacceptable winds. The need for a minor rocket repair on Friday pushed the launch back another day. Once deployed, SMAP's giant antenna will help create a global map of topsoil moisture levels every three days through the mission's initial three-year lifespan, NASA officials have said. The huge, rotating antenna — which measures close to 20 feet (6 meters) in diameter — is the largest of its kind ever flown in space, according to NASA. The satellite should beam back information about soil moisture with unprecedented accuracy. "SMAP, or the Soil Moisture Active Passive mission, this morning is going to be incredibly important because it will be the first space-borne asset that allows us to look at freeze/thaw cycles; to determine the difference between areas of Earth that are frozen and those that are with normal moisture; and it helps in understanding the carbon dioxide cycle also, which we believe contributes to the planet's change," NASA administrator Charles Bolden said during a webcast before launch. Scientists want to learn more about soil moisture for a variety of reasons. For one, it will give them a more detailed idea of where and when droughts could happen. And on the flip side of that, SMAP data is also designed to help researchers get a better sense of where floods might occur based on soil moisture data. 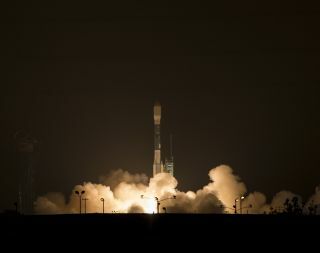 NASA's Soil Moisture Active Passive satellite (center in distance) deploys its solar arrays after separating from its Delta II rocket following a flawless launch into space from California's Vandenberg Air Force Base on Jan. 31, 2015. This image was captured by a camera on the Delta II rocket upper stage. Scientists will use the global soil moisture data to more fully understand the interconnected nature of three of Earth's major cycles — the carbon, water and energy cycles — in order to create more accurate weather maps and predictions. Researchers need an instrument like SMAP because there are too few ground-based sensors to create a highly accurate global map of soil moisture right now, Entekhabi added. The $916 million mission joins the 19 other Earth-gazing satellites currently monitoring the planet from space today. SMAP will be in an orbit that takes it about 426 miles (685 kilometers) above Earth's surface. SMAP is one of five Earth-monitoring satellites originally scheduled for launch in 2014. NASA's Orbiting Carbon Observatory-2 satellite, Global Precipitation Measurement Core Observatory and ISS-RapidScat all went to space last year, with the fourth — the agency's Cloud-Aerosol Transport mission — launching earlier in 2015. SMAP is the last of those Earth science missions to fly.